But people are that complex. Every single human being that walks this earth consists of many layers, multiple facets. Whether we are lovers of fairytales who are the furthest thing from romantics (Who, me?) or admirers of magic living in an ordinary, mundane world, we are all walking contradictions. Some of us just don’t realize it yet. Me? I’m a writer—an artist, if you will—and artists tend to delve deeper into life than most people dare to go. That doesn’t mean the others are not capable of such feats; it simply means they haven’t been curious enough to explore. Sometimes I consider how simple my life might be if I had never left this town. I have tried (and failed) to wrap my mind around what it would be like to have gotten married right out of high school and given birth to those six kids my childhood self thought I wanted. What would I think and feel and believe had I settled for what was right in front of me and never explored the expanse of the world? I think I could be quite happy there, in my simple life, not knowing any different. Because, you know what they say: ignorance is bliss. I, however, never afforded myself that luxury. I reached for something bigger, deeper, different. I got a taste of the world and now I cannot go back to being a small town girl. It’s a beautiful thing; it’s a terrible thing. It’s where I am right now. And last night, my current predicament led to a long conversation with a middle aged man about how I am a genuine, one-of-a-kind, there-is-no-one-else-even-remotely-like-me-in-the-world. Despite my protests that I am not “looking” for anyone, thank you very much, he insists that I am looking for something that does not exist. There are no such thing as unicorns, he says. Herein lies the real problem with people who tell you that you need to lower the impossible standards they imagine you to have: they are never clear about where the mysterious line is drawn. What is the perfect amount of compromise? Where do my standards switch from high to impossible? …I should have to settle for this? I’m going to be honest here. I don’t think I demand anything unreasonable out of life. I want to write books, but they don’t have to be number one bestsellers (although I obviously would not complain if they were). I want to bounce around the world for years to come and maybe have a flight experience where nothing is delayed or cancelled or otherwise complicated. And if I ever do get married, I just want it to be to someone who thinks and feels about the world the same way I do. If I am looking, it is for someone to share in an adventure. I don’t want a small life. I don’t want safe, comfortable, or conventional. I don’t want the shallow, the superficial, or the daily grind. I want to always search bigger, dig deeper, and see beyond what most people dare to dream. Perhaps what I want is unreasonable after all—a life lived entirely Beyond Reason. A life fully abandoned to faith. And trust. And perhaps a touch of pixie dust. Honestly, I’ll be okay if I never find a unicorn, so long as the journey is magical. Hello, my name is Rebekah and I have commitment issues. I am basically terrified of committing to anything. Not because I lack trust or fear betrayal, but because I am so terribly bad at un-committing from things. My mama named me Devoted; it clung to me something fierce. I blame her for everything. But seriously, I way over-committed myself this winter. I thought I was going to Africa for two months. My plan when I came back was to play fill-in nanny for a few months and figure out where I was going from there. I didn’t go to Africa. Which means I didn’t quit my other job. Which means I was working fifty-ish hours a week on a sleep schedule that resembled a tilt-a-whirl. Late nights. Early mornings. Up and down and spinning around and would someone just let me off this ride before I get sick? I developed a love/hate relationship with the short hours between 12 and 5am. If I didn’t require sleep, I would have spent that precious time writing. But five hours doesn’t cut it for this girl. For sleeping or for writing. I came out of this experience like a zombie, stumbling through the familiar motions of life, but having forgotten how to feel any of it. Seriously, guys, I almost died. Or maybe I just wanted to die. It’s all a little fuzzy now. I do remember having a complete mental breakdown in the month of March and calling in dead to both of my jobs one tragic Monday. I think I spent that Monday curled up in the fetal position, telling myself over and over that this was no way to live. No. Way. To. Live. That’s when the plotting, the searching, the scheming began. What could I do to make myself feel alive again? “Let me know when you do,” he said, in a way that made me realize that he and I have two, very different definitions of Off the Deep End. Because to a girl who has walked the straight and narrow most all of her life, Off the Deep End isn’t drinking and partying and waking up in a stranger’s bed. That sort of stuff has no appeal whatsoever to me. My idea of Off the Deep End is jumping in my car and driving all the way to the west coast just because I’m curious to see how different the Pacific Ocean looks from the one I tend to frequent. It’s backpacking through Europe because history and poetry and, eh, why not? It’s jumping on the next plane to the Maldives because I hear they’ve got this restaurant there that is entirely underwater and it’s like eating in the world’s biggest aquarium. Plus beaches and paradise and the possibility of a life-changing encounter in an airport. It’s restless feet and a gypsy soul, and who has time for superficial stuff when adventure is there for the chasing? But I don’t live it. Not as often as I would like. I’m far too practical for that. I sort through everything, over-analyze it, and dismiss the things that don’t have a “purpose.” As if every single thing I do has to be of insurmountable significance or I won’t do it at all. Those are my options: Do or do not. And mostly I convince myself it’s best to do not. As if accomplishing nothing is better than accomplishing something if there is no significance attached. Maybe the only significance the above list would have is to make me happy. To shake things up. To splash a little bit of color into the life my tedious hands have painted in layers of gray. And maybe that would be okay. Maybe it’s not a bad thing, or a crazy thing, or an irresponsible thing to step into new spaces and be an adventurer every once in awhile. But this time I settled for something a little closer to home. I signed up for ice skating lessons. Yeah, I know. It’s a bit of a letdown after the suggestions above. But ice skating is something that always makes me feel alive, and I wanted to learn the mechanics of it. I wanted to know how to twirl. Saturday was my first class. It was good, I guess. But it was less of the exhilarating freedom of flying so fast and more of the nitty-gritty details of learning to propel myself backwards. And when I say “propel,” I mean propel is the goal, but it’s a little more tedious than that right now. It’s slowly sliding and scraping my way across the surface and ending up facing forward again before I even know what happened. I think that’s an accurate reflection of my life right now. There was a time when I just blindly soared through it, laughing and living it up. I’m in a different season right now—a more intentional one. I’m studying the mechanics of it, learning how to do it right. I’m just slowly scraping by right now, but I am okay with that. Because one day soon, I’m going to know how to twirl. Do something that makes you feel alive. Because we all need to learn how to take the breathless, fearful step Off the Deep End. 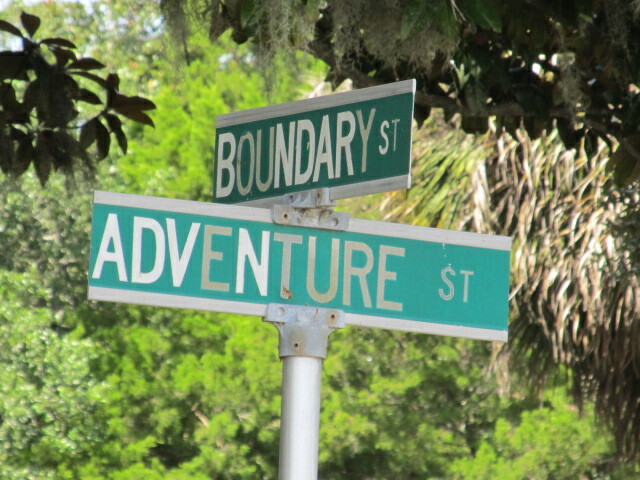 I don’t know who named the streets in Beaufort, South Carolina, but I could hug the guy who juxtaposed Boundary and Adventure. In the eight years I’ve been heading south for September I’ve been drawn to that street—Adventure, that is. Funny thing is, I never set toe or tread on it until a little over a week ago. And it makes sense, I suppose, that I’ve never turned down that road in the past. Because Boundary Street will take me where I need to go. It’s the main drag through town—the road everyone drives in comfort knowing it will lead to all the important things, while Adventure Street is just a little road that leads to God only knows where. Hence the name “Adventure,” right? I think life is a lot like the streets of Beaufort. Everyone says they want a little adventure, but they’re too afraid to step outside the familiar confines of the boundaries they’ve made for themselves. I’m guilty of it, too. That’s why I made a little detour on the way to the beach last week. That’s why I pulled my car over to the side of the road and took a little stroll that fine Saturday afternoon. I’m guilty of singing Disney tunes as I go throughout my day. I can’t count the number of times the lyrics, “I want adventure in the great wide somewhere” have come out my mouth. And in the moment I think I mean them, but I don’t. Not really. Because I bypass Adventure and keep on cruising down Boundary more often in life than I care to admit. I could have the Beauty and the Beast soundtrack blasting from my car speakers as I sing along with the reprise of “Belle” and still drive right past Adventure Street. Because Boundary is so comfortable and familiar and I never have been one for scenic routes. But I think we all need a little more Adventure in our lives. I think we all need to take those detours that lead us down abandoned side streets. I think we all need to do a lot more than sing about the adventure we want to live. So get ready to slow down and take a right turn up ahead. Adventure is calling your name. I watched Nim’s Island the other night. Not my favorite movie, but it happened to spark something in my heart on this particular night. If you haven’t seen the movie, when eleven-year-old Nim’s father gets lost at sea, she sends a distress call to the adventure hero, Alex Rover. Unfortunately, Alex Rover is actually Alexandra Rover – a novelist who happens to be “mildly agoraphobic” and hasn’t left her apartment in six months. But when she gets this email from Nim, she finds herself on a rescue mission. I don’t want to touch the world. I do, but I don’t. I do, but I’m scared. I do, but… I do. I do want to touch the world. I do want to leave a mark here. I do want to take God’s hand and step out into the unknown. I do… even when I don’t. The same arm He extends to me is extended to you. So come along with me. Forget your fears, take His hand, and touch the world. Sweep again, and by then it’s like 7:15. Thus begins Disney’s Tangled. These words launch Rapunzel into the adventure of a lifetime – the only adventure our heroine has ever experienced. 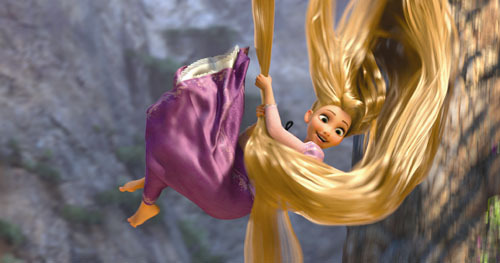 I find it interesting that Rapunzel was still waiting for her life to begin at sixteen years of age. It’s easy to assume that her life couldn’t begin until Flynn rescued her from the tower, but if you’ll look again, you’ll see that Rapunzel was the one who let herself down from the tower. So here is the irony of Rapunzel’s opening song: she was always the one who held the power to make her life begin. It wasn’t that life couldn’t begin, but that it wouldn’t begin because it was fear that kept Rapunzel in that tower all those years. I believe that many of us are just like Rapunzel, staring out the window at an unfamiliar world, wondering when our lives will begin. Some of us will stare out that window our entire lives, never daring to leave the prison we call home. Some of us will never take the first step, never dare to leave the tower and feel the cool grass on our toes. I pray that you will be one who will pursue your dreams. The world is unfolding before you. The possibilities are endless. What will you choose to do with your life? It doesn’t matter how young (or old) you are; it’s never too early (or late) for life to begin. No matter how long you’ve waited or how many mistakes you’ve made, today is a new day. So come now, Rapunzel, let down your hair. Climb down from your tower and let the adventure begin.